The doors to Harrogate Christmas & Gift open today (Sunday) and as always, visitors are in for a fantastic few days of festive fun. This year we have over 120 exhibitors filling seven halls of the Harrogate Convention Centre – and over 30 of these are brand new companies showing products for the first time. Be sure to make a bee-line for Hall Q which houses many of the new exhibitors and also has the main catering area for the show, offering a place to sit and meet over something to eat or a coffee. If you’ve got a sweet tooth then a trip to Chocolate Genie is a must – with gorgeous hand-crafted Belgium chocolate novelties that are a little unique and guaranteed to make people smile. 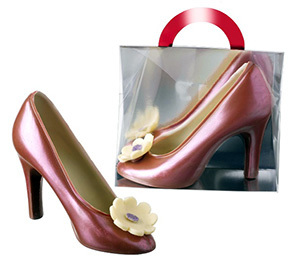 Confectionery includes stunning high heeled shoes, flowers for Mother’s Day, roly poly sheep, funky chicks for Easter and other gifts for that special occasion. The company believes in being a quirky in order to be different and this is enhanced by the inhouse design team which translate ideas into moulds and the final fabulous products. The finished results have an artisan touch which carries the company’s identity ‘handmade with magic and passion’. Supplying to upmarket retail outlets including delis, bakeries, farm shops and department stores. Visit Chocolate Genie on Stand Q83. 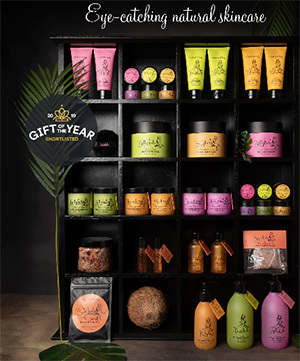 Bettyhula, a Hawaiian scented natural skincare gifting range, has launched a new product to replace talc as we know it. The company’s all-natural dusting powder (with no toxic nasties) has already been a gifting hit this Christmas and has been shortlisted for the Gift of the Year Bath, Beauty and Skincare category. It has a cute black fluffy puff to apply the gorgeous scented powder which complements the rest of its award-winning range. The striking packaging makes for an eye-catching shelf seller an all products have been handmade in the UK using traditional techniques and the finest quality, natural ingredients. Prices are great too with Natural antibacterial hand cream retailing at £4.99 – a great present / stocking filler / Secret Santa gift.